When it comes to fashion, I want everyone to be able to rock those trendy styles and feel confident when they step out each day. But, let’s be honest, the price tag on some of those designer pieces is out of control – especially when you can get the same looks for less. That was a huge reason I started Murph Boutique. Our mission is to offer a collection of styles, sizes and price points for every woman, so that she may look and feel her best and most confident self every day. You’ll find most pieces are under $60 (we have a couple splurge items! ), we offer sizes XS-3X and the looks are modern and on-trend. I’m always browsing fashion sites and looking for the next hot trend. And in my search, I have seen so many high-end pieces that we carry similar styles for a fraction of the price at Murph. Here are some of my current favs! Animal prints are taking over this fall – especially leopard. I’ve always looooved leopard print, so I am so glad the trend is back this year. I found this leopard jumpsuit at REVOLVE for $188 and we have a similar style at Murph with the Can’t Be Tamed Jumper for only $38. It’s the perfect transition piece and is so versatile to style. It can be worn as-is on those few warm days we have left. And once the temps drop a little, pair it with a denim jacket and sneaks for a casual look. Or dress it up with a leather jacket and booties. Velvet itself is such a luxe, rich fabric. Then you throw in these trendy bold hues and this is such a fun look to style. I’ve seen fuchsia, green, mustard, wine … the list goes on. But these gorgeous cobalt blue pants may be my favorite! 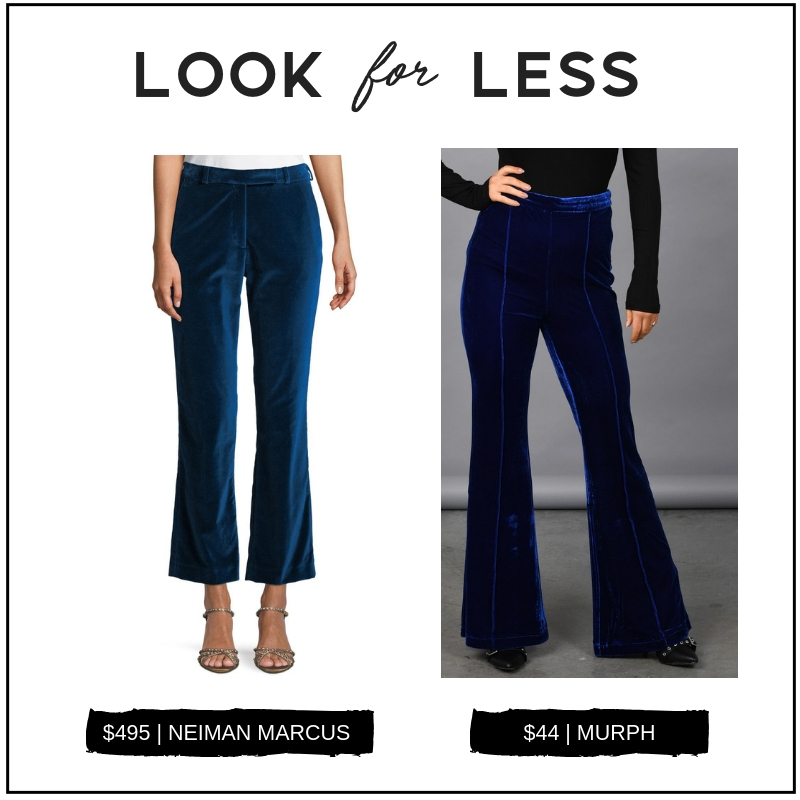 I saw these similar flared velvet ankle pants at Neiman Marcus for $495 recently. And we’ve got the Make Them Wait Pants at Murph for only $44. They are perfect for the office with a nice button-down blouse or really make a statement with this faux fur jacket. These pants will be perfect to dress up for holiday parties! Can you ever really have enough glitter? Never! Every holiday season, we see lots of sequin and sparkly dresses and tops. But I am LOVING these glitter booties for an understated pop of fun. If glitter can be understated?! 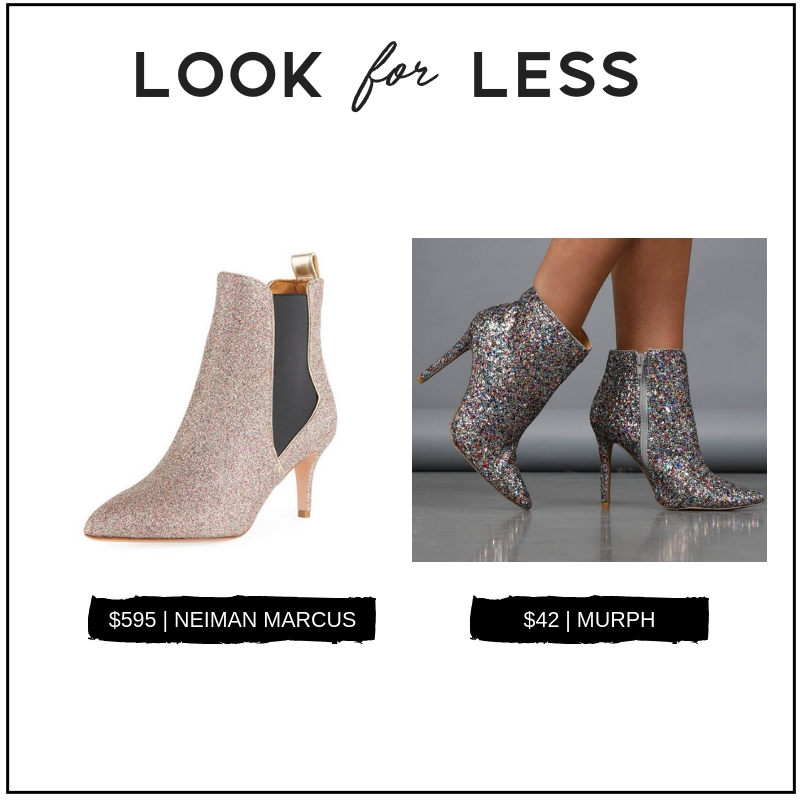 Neiman Marcus is selling the Veronica Bear booties for $595 while we have a very similar pair at Murph with the Never Enough Glitter Booties for $42. For a NYE-worthy look – or even just a night out with your boo – pair them with a little LBD. Or if you want to add a little fun to an everyday outfit, pair them with jeans, a basic tee and a leather jacket for a casual cool vibe. Fashion is really all in the details. A denim jacket is as much of a basic staple piece as you can get. But add in this fun ruffle detail and you’ve just upped your style game. 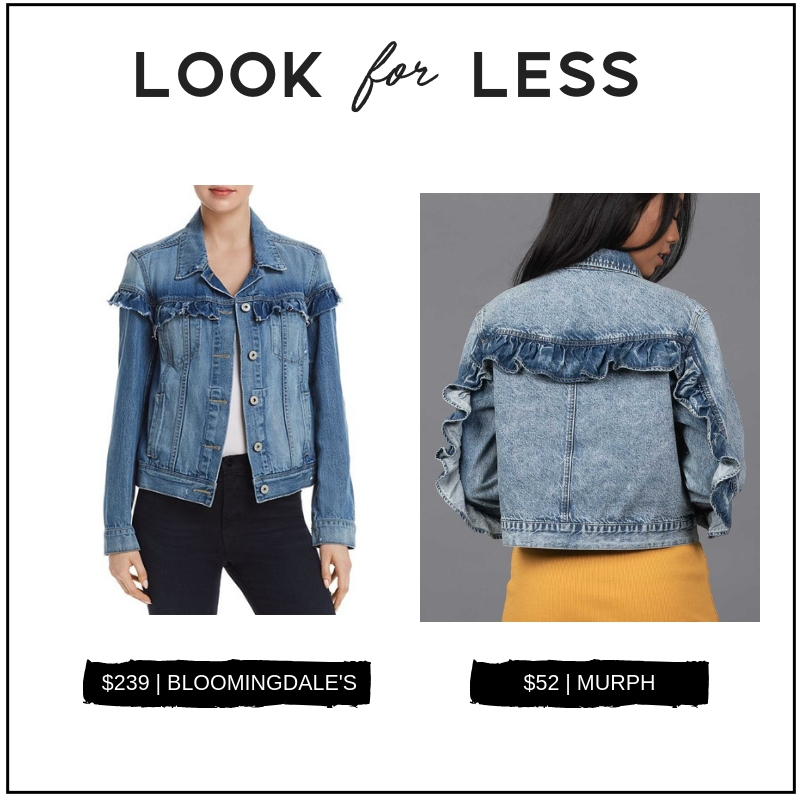 This ruffle trim denim jacket sells for $239 at Bloomingdale’s while we have a similar – and in my opinion, more stylish – style at Murph. The All In The Details Denim Jacket is only $52. This jacket is perfect for this time of year to easily layer for warm and cool days. Throw it on over top of a basic dress for a cute weekend look. Or dress up your athleisure (emphasis on the “leisure”) look by pairing it with leggings and an oversized top. Remember when I said animal prints were taking over and I love a good leopard print? I just can’t help myself! 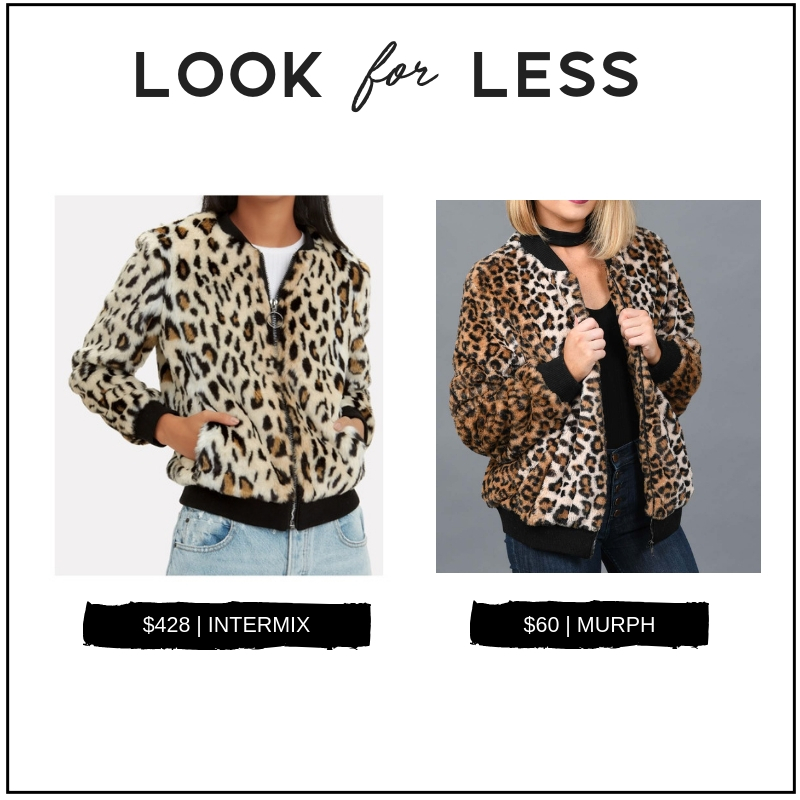 Leopard is hot right now and bombers are hot right now. So you can’t go wrong with a leopard bomber. This jacket at Intermix is going for $428 while we have the similar A Walk On The Wild Side Bomber Jacket for $60. It’s still a splurge but definitely better than $428! We literally just got this in so I haven’t even had a chance to wear it yet. But I would pair it with a hot LBD and these red patent leather booties for an edgy look. Or if I’m just out running errands, I would go with some boyfriend jeans, my favorite basic tee and some sneaks. When a piece is so versatile like this, consider it an investment in your wardrobe because you will get so much wear out of it! 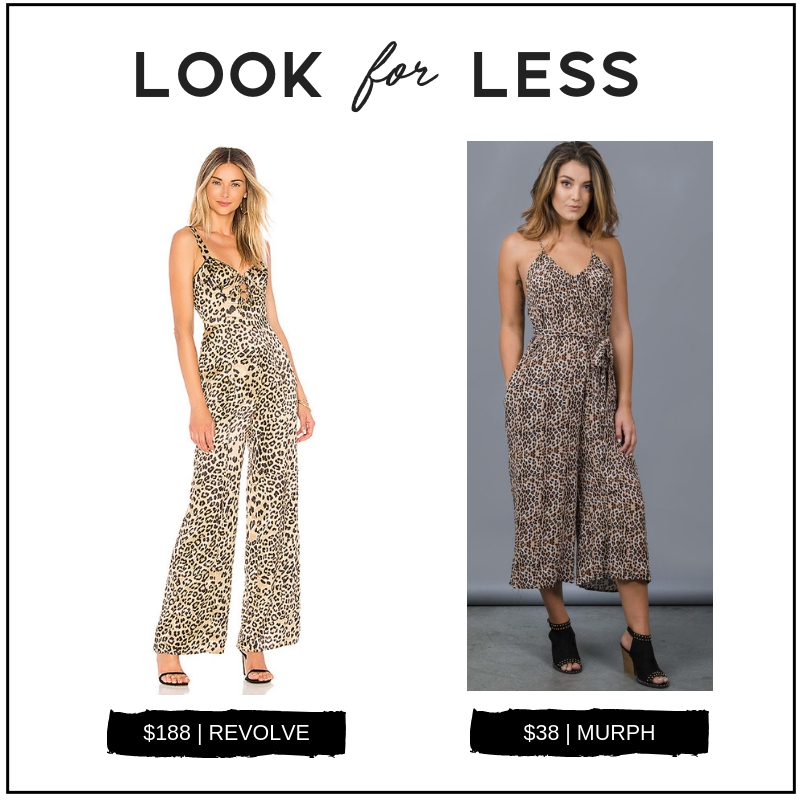 I’m always keeping my eye out for trends so that we can off the same looks for less at Murph. I’d love to hear what kind of styles you are looking for – or any style questions in general. Please comment below! In case you missed it, I blogged recently about How To Wear Three of Fall’s Biggest Trends with some looks from Murph! And as always, I’d love to see how you all styled these pieces. Be sure to tag @shopmurph on Instagram so I see them!